Morbark offers a full line of Wood Hog horizontal grinders in a range of sizes, on tracks or tires, diesel or electric powered. Add a wide variety of available options, and you’ve got the flexibility to customize the perfect grinder for your particular needs.The Wood Hog is the best industrial-grade grinder you can get for processing brush, yard waste, clearing debris, storm debris, C&D waste, other mixed woody feedstocks, and asphalt shingles into saleable products. All Wood Hogs come standard with the Morbark Integrated Control System (MICS) to maximize production and engine efficiency; a laser-cut, factory-balanced rotor for unsurpassed durability; and an aggressive feed wheel with an internal poclain drive that has no chains or sprockets for more torque and reduced maintenance.The proven breakaway torque limiter driveline protection system protects against catastrophic damage from contaminants. 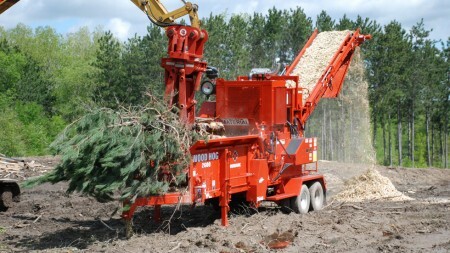 And with the optional Morbark Quick Switch Grinder-to-Chipper Conversion Kit, you can use your Morbark Wood Hog to produce high-quality – and highly profitable – biomass fuel chips or sawdust. These are just some of the reasons that Morbark is the largest and most respected name in grinding.